Wheelhouse Apartments offer luxury accommodation on the edge of a World Heritage wilderness, the oldest living rainforest on earth. 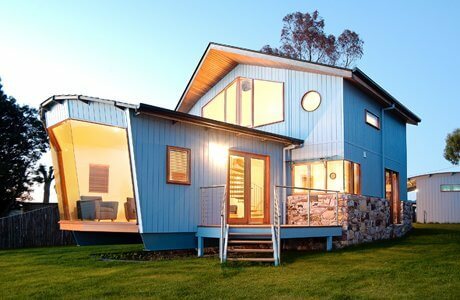 This stunning, contemporary retreat offers unsurpassed views of the West Coast of Tasmania and a clever design assures that the dramatic vistas of Macquarie Harbour aren't just seen but experienced as the centrepiece of the building itself. The retreat offers two fully self-contained units, each with two bedrooms. 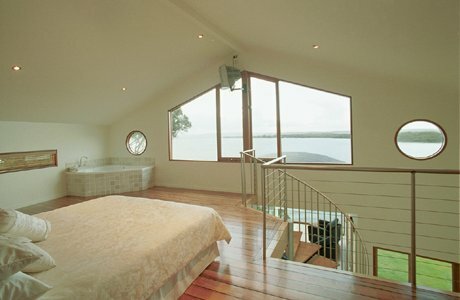 The master bedroom is upstairs with a spa bath in the room and a separate en-suite bathroom, the second bedroom is downstairs. The lounge is cantilevered towards the cliff-top on elevated steel girders. At the front, huge glass windows lean outward at the top. 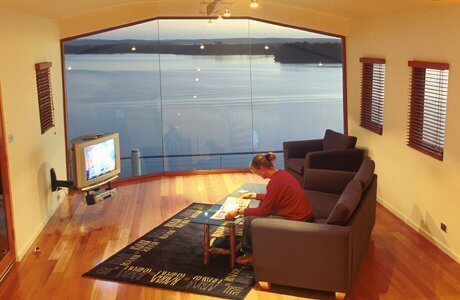 The maritime feel is subtly accentuated by polished timber floors and sun decks with barbeque facilities.